He just needed someone to comfort him. Almost every day, at the edges of rapidly diminishing rainforests, heart-wrenching dramas are playing out that most people don't even know about. One such story begins on a riverbank near a village on the island of Borneo in Indonesia. 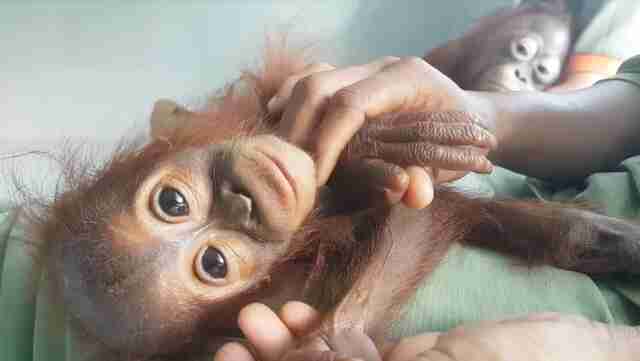 When people at the Borneo Orangutan Survival (BOS) Foundation's Orangutan Rehabilitation Center received calls about an infant orangutan spotted all alone by a river, they knew something terrible had happened. Orangutan families are incredibly close — mothers stay close to their babies for up to eight years, teaching them how to climb and be independent. So the fact this baby was alone was alarming, and rescuers knew there was probably more to the story than locals admitted. 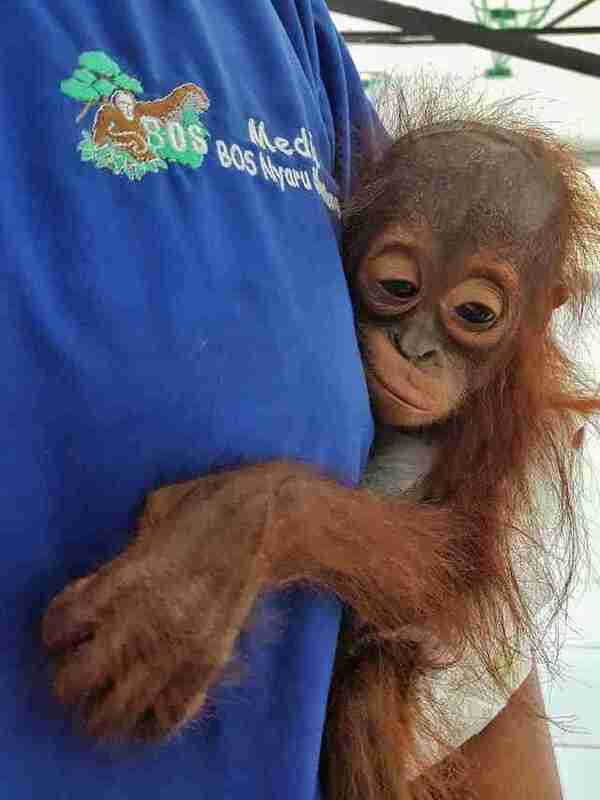 "A mother orangutan would never abandon her infant," BOS Foundation said in a release. 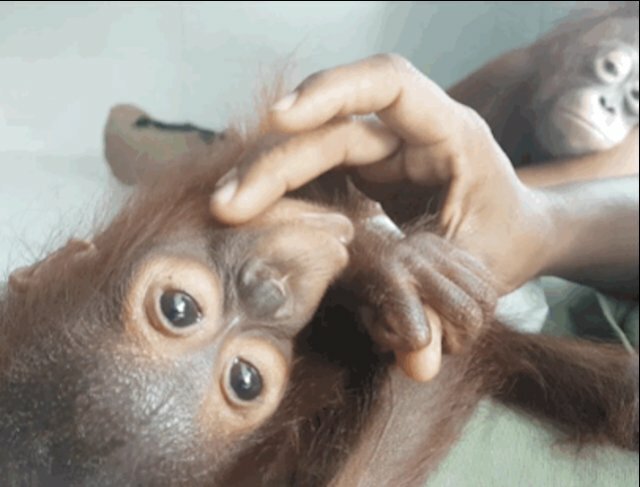 But the priority was to get the baby orangutan, estimated to be just about 6 months old, to a safe place, so they brought him back to the rescue center. What the baby didn't realize was he was about to meet someone who would be able to empathize with his plight. 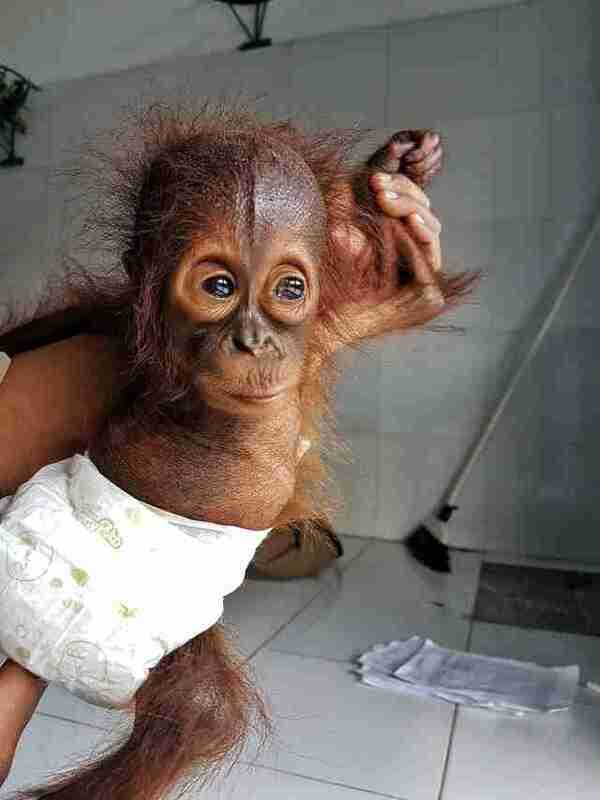 Just the day before, rescuers had saved another orangutan who had been torn from her family right after she was born. 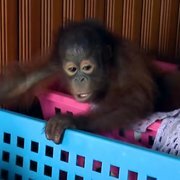 "She had reportedly been held captive by a local family for around three years, meaning she was taken from the wild at a very young age," the BOS Foundation wrote. 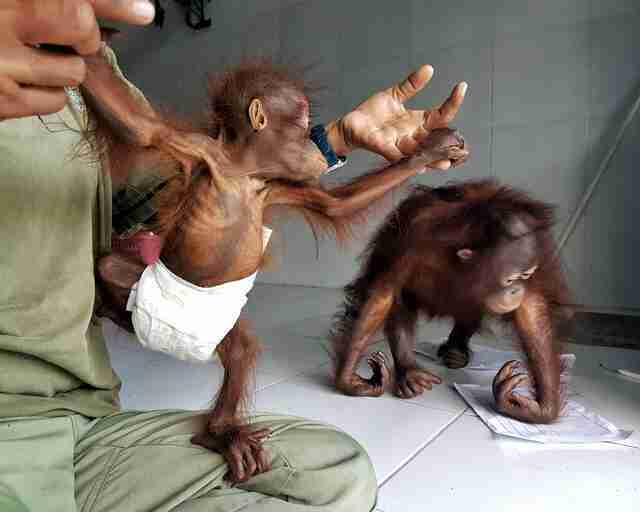 Both orangutans, who were underweight and malnourished, are starting to feel like themselves again. They're even playing little games with their rescuers and starting to climb around. It's a whole new life for these two, but so many aren't so lucky. Orangutans are critically endangered because the delicate rainforests where they live are being razed for palm oil plantations. 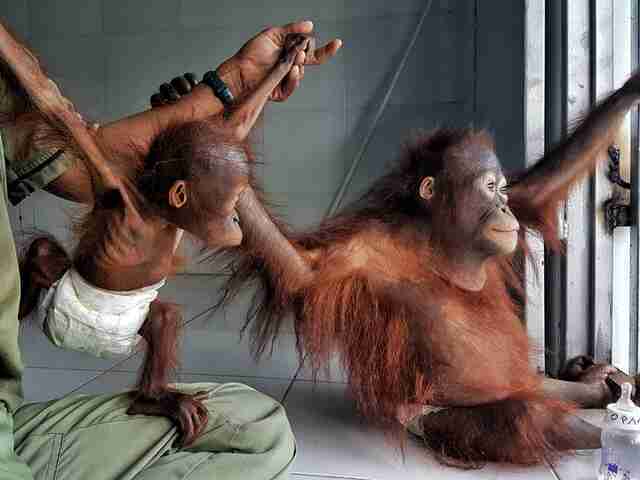 More and more orangutan families are being torn apart as they lose their trees and come in close contact with people. 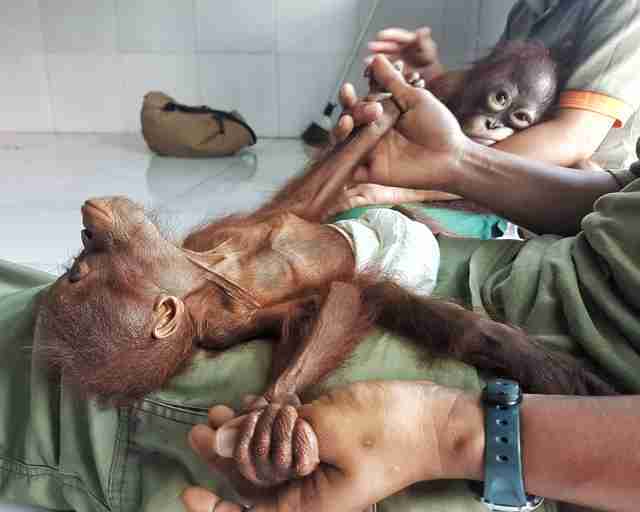 But there's a simple way to help stop these sad stories from ever happening: Check the list of ingredients on common snack foods and products and don't buy anything with palm oil in it. Orangutans will thank you for it. 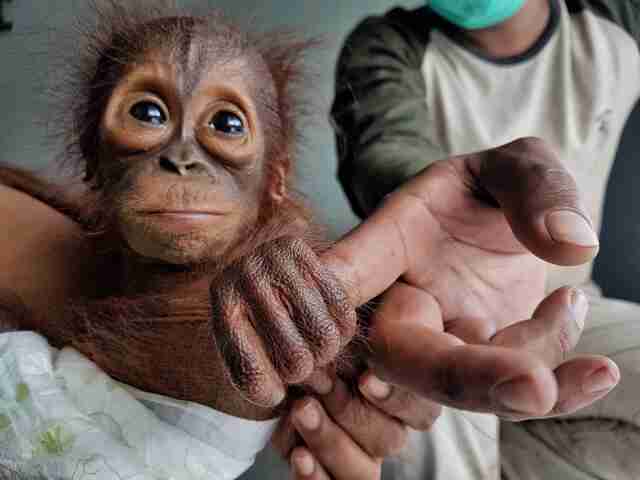 To help the BOS Foundation give a home to more orangutans you can make a donation.